One of the greatest mysteries of the PlayStation era was the unenthusiastic commercial response that Rage Racer was met with. A bold and sleek progression of the Ridge Racer franchise, it offered greater depth of customisation, more cars, more tracks and arcade gameplay tuned to near-perfection. Thus identifying a key factor for the lukewarm reception that greeted what was at the time the systems best racing game is difficult to fathom. Could the muted visual style and simulation undertones have convinced fans that Rage had abandoned the series fun-fuelled origins? 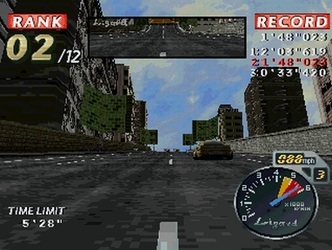 Indeed, it’s quite possible that at the time of the games release, the more realistic racers were already starting to court the gaming public more effectively. 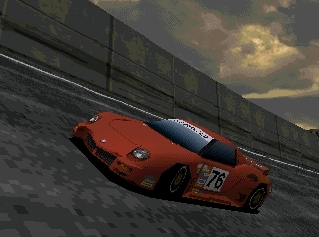 Perhaps fans were disgruntled by the rather ‘safe’ Ridge Racer Revolution, or felt the series as a whole was no longer in vogue. 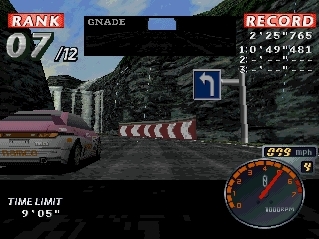 All (or conversely, none) of these factors could have played a role in Rage Racer sinking, but if its attempts to provide more depth proved a turn off to fans, it was with a sad irony, as Rage Racer remains the most purely playable arcade road-racer ever to grace the PlayStation. What’s immediately evident is the ditzy glamour of the early games has been consciously set to one side. Rage Racer is sleekness personified; from the monochrome menus, to the purring tones of the announcer and grid-girl Reiko Negase’s black pit overalls, it’s been given a gritty make-over that seems worlds away from the bright skies, beaches and general luminescence of Ridge Racer Revolution. The darker, city-based tracks are nothing short of masterpieces both in terms of visual quality and design characteristics. 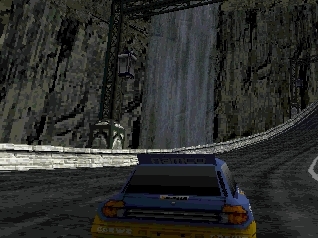 The opening track, Mystic Coast, hints at what’s to come; having traversed cobbles and a climb past a waterfall, the gamer is treated to a screaming descent that overlooks an immense harbour – all within the first thirty seconds or so of playing. This is swiftly followed by the game reverting to more familiar territory; all of the tunnels, sweeps and advert-hoardings you’d come to love from the earlier games appear as good as ever, and all this is just for starters. The second course, Over Pass City, places great demands on acceleration due to some quite biblical, alpine-esque ascents through a skyscraper-populated urban jungle, the importance of carrying speed through the preceding corners is at a premium and also justifies the great range of cars on show; thus the Lizard motors, largely useless on the other tracks due to heavy handling, suddenly gain a great advantage with their sprightly acceleration characteristics. The toughest challenges are saved for the third track, Lakeside Gate, with its jarring sequence of sharp sweeps; a tight, all-or-nothing hairpin right at the end and a hold-you-breath chicane that requires skill and nerve to take flat out – it makes for a fantastic test of concentration and skill. It’s all helped by razor sharp handling that’s arguably never been bettered in a Ridge Racer. The powerslides are still superb fun and massively satisfying when judged right – something that will still require a fair bit of practice even for RR veterans, just because of the immense speed you have to cope with in the latter phases of the game. With the option to alter the grip levels of your car, cornering can be taken with a relative degree of realism – but where’s the fun in that? The mix of cars is much better this time around with a great selection of American-styled muscle cars, trucks, saloons, super cars and nippy-handling run-arounds, all of which offering their own pros and cons that are exploited nicely by the courses themselves, and just to add extra spice to the proceedings, the very best cars use manual transmission only – meaning the player has to judge gear changes themselves. Along with the self-explanatory Time Trial mode, Rage Racer’s main attraction is the Grand Prix. Finishing in the top three in each of the three races opens up a new speed class, of which there are five (plus five more for reverse courses and an Extra class upon completion of both). 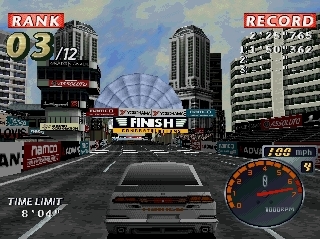 In order to progress, the player must make use of the new customisation features, which allow the player to paint and alter the look of the cars and, with enough credits attained from high race finishes, gain a general tune-up in performance – crucial in progressing to the final stages. What’s especially neat is that with these tune-ups, the cars also alter in appearance; some sprout rear wings, whilst others feature expanded engines, bigger exhausts and, in the case of one car, an entirely remodelled roof. By Class 3 the gamer is given an unexpected treat; a fourth track, known as the Extreme Oval. Here Rage Racer really gets to stretch its technical legs, as with no powersliding and little cornering to worry about, your main goal instead becomes edging around other road-hogging cars along the tracks banking at frankly ridiculous speeds. Impressively, even at the retina-blistering pace it manages, scenery pop-up is kept to a minimum and there is barely a hint of slow-down at any stage despite high levels of detail. Musically it once again delivers, whilst the engine notes are gut-wrenchingly good. Each motor growls through the gears with a ferocious energy, and produces echoing howls as you rocket through tunnels, something that proves endlessly satisfying. Minor foibles include a couple of things that Namco have been guilty of prior to Rage Racer and really should have sorted out – chiefly the lacklustre collision detection that makes passing cars that hog the middle of a narrow road nearly impossible at times, as you seem to bounce off them whenever you get even close. 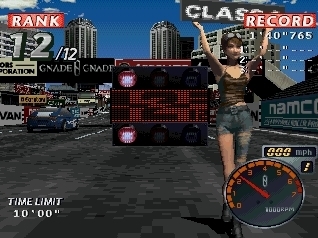 Also the absence of a split-screen two-player mode or even a link-up option is something of a disappointment, given that Ridge Racer Revolution at least included the latter. But it doesn’t dampen what is, was, and probably always will be, an immensely enjoyable racing game. With all the races and upgrades on display there’s plenty for fans to busy themselves with, and though on the surface it doesn’t offer a great deal more than previous games in terms of statistical content, there is far greater scope for longevity in Rage Racer. With five standard classes, five more for the challenging reverse courses and ultimately a sixth for supercars, this certainly isn’t something you’ll finish in a hurry. Trophies can be attained by winning every race in a Class and there are also a number of secret cars to unlock, which will require weeks of practice to get near. Rage Racer is a supremely classy racer and even to this day, provides a masterclass in design and playability. "Rage Racer is sleekness personified; from the monochrome menus, to the purring tones of the announcer and grid-girl Reiko Negase’s black pit overalls, it’s been given a gritty make-over"